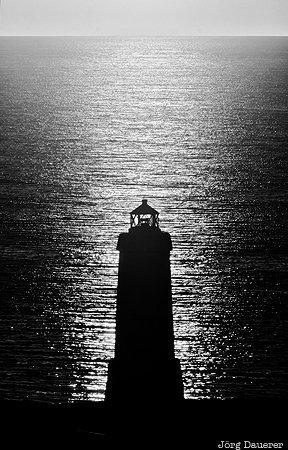 The silhouette of the back-lit Ólafsviti Lighthouse near Patriksfjordur with the calm water of the Westfjords in the background. Patriksfjordur is in Vestfirðir (Westfjords) in the north west of Iceland. This photo was taken in the evening of a sunny day in June of 2012. This photo was taken with a digital camera.